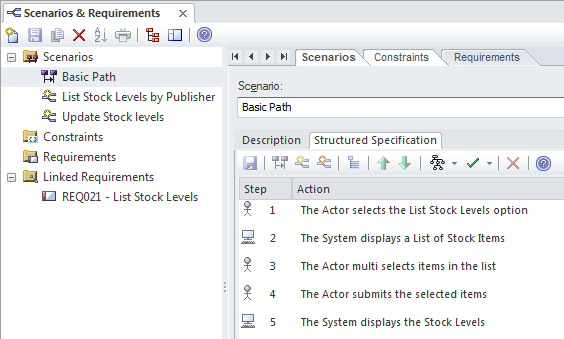 The Scenario Builder is used to define the details of a Use Case including defining detailed descriptions, creating one or more Scenarios and defining pre-conditions, post-conditions and other constraints. The detailed steps of a Use Case can be recorded and linked to other elements in the model and these can then be generated out as a diagram providing a visual representation of the Use Case and its Scenarios. The diagram and the text can be synchronized and individual steps can then be traced to other elements such as Components that will realize the Requirement specified in the Use Case. To define the details of a Use Case and its scenarios and consraints which can be used to replace the traditional text-document based approach to defining Use Cases. This ensures that the Use Case diagram and the textual details of the Use Cases and its Scenarios and Constraints are all contained in the same model and can be traced. If the Use Cases are required in a document format for contractual or process reasons a Use Case Report can be generated automatically from the models using the in-built documentation engine. 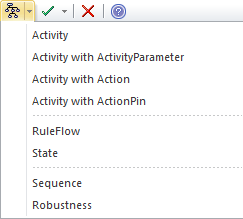 The Scenario Builder can be viewed as a tabbed or a docked window or in an element's Properties window. The steps of a Use Case including its Scenarios can be automatically generated into a number of different diagram types available from the Generate Diagram toolbar icon.